An opportunity to personalize one’s education, explore specific areas of interest, and grow professionally. The program is designed to develop clinical, research, and discipline-based skills; foster networking; provide experiences that will influence career opportunities; and cultivate desirable personal attitudes in, and behaviors of, future members of the veterinary profession. Students complete a minimum of 3 selective credits during the first five semesters of the DVM program, emphasizing one or more areas of special interest. Students may either enroll in a sustained program, such as a combined degree program, or they may experiment with several different interest options. Lyle Cleary (V'17) has a strong interest in exotic animal care. He approached Dr. Jennifer Graham, head of the Zoological Companion Animal Medicine (ZCAM) service and together they created a unique selective to match his interests. The Tufts at Tech student-run primary care veterinary clinic provides low-cost care for family pets within Central Massachusetts’ underserved communities. Tufts at Tech is an innovative teaching facility for DVM students at Cummings School and high school students at Worcester Technical High School who are studying in the veterinary assistant program. They work collaboratively under the direction of experienced, highly-trained veterinarians and certified veterinary technicians to provide quality primary care for family pets. Meet Eric Littman, V'17, a DVM candidate at Cummings School of Veterinary Medicine as he discusses his Self-styled Selective in Aquatic Medicine. These courses and clinical experiences attract students interested in learning about, and gaining experience in, shelter medicine. Options range from the study of animal welfare, veterinary forensics, and small animal medicine including emergency care, diagnostics, pathology, and vaccinations, to hands-on experience in urban shelters and farm sanctuaries. Selectives at the Wildlife Clinic engage students in the daily functions of the clinic and introduce them to hands-on wildlife care. They participate in daily patient rounds; procedures such as anesthesia, radiology, surgery, and necropsy; and didactic lectures in subjects such as avian radiology, ophthalmology, and neonatal care. 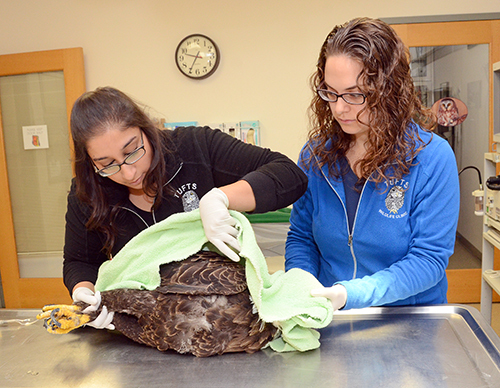 Additionally, students observe close interactions with state and Federal wildlife agencies, wildlife rehabilitators, public health officials, and other animal organizations such as MSPCA and Animal Rescue League. These selectives are designed to introduce students to the use of animals in biomedical research and the role of the laboratory animal veterinarian. Possible activities include presentations on regulatory control of research animal use, animal models in biomedical research, and ethical use of animals; a laboratory animal anatomy module including three dissection labs; tours of rodent and primate facilities; and mock Animal Care and Use Committee meetings. Various opportunities exist for the student interested in community medicine and service. Support programs such as the Pet Loss Hotline and Paws for People; our affordable-care community clinic, Tufts at Tech; and educational outreach programs like Gap Junction provide important training to our students and invaluable services to the surrounding communities. The Large Animal Hospital on campus provides students hands-on experience with out-patient/inpatient cases, including critically ill newborn foals in the neonatal intensive care unit. Other opportunities include a popular selective for second year students on clinical equine exercise physiology and various clinical experiences in area practices and veterinary hospitals.